Not only do I use these for gifts but I have in my fridge a bottle of these almost all the time. Your friends will love getting a bottle of these around the holidays or really at anytime. These are really as good as any you can buy and are easy to make. You can use green or black olives. I prefer the black varieties because the are a bit more versatile in many other recipes. 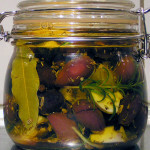 There are several brands of vacuum packed or dried in jars that are excellent for this recipe. 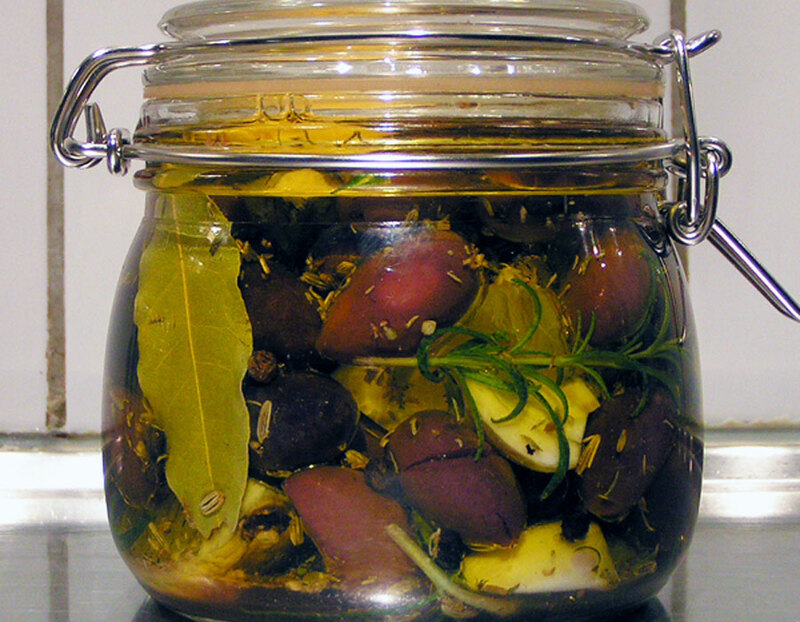 You can use this recipe to marinate your olives to serve at dinner in a salad, as part of another recipe or part of an Antipasti. There used are endless! From the day you make these they will keep in the refrigerator for 6 weeks and are ready to use after 1 week. These are really as good as any you can buy and are easy to make. You could assemble all the ingredients in a few minutes and have 10 jars made within a half hour. Preheat the oven to 100 C or and place the jars into it to sterilize for at least 20 minutes. Remove them and let them cool a little so you can handle them. Open the olives and with the side of a heavy knife crush them just enough to open them a bit so that the marinade will penetrate their skins. This is really important if you are using harder green olives. In the bottom of the jar place a big pinch of the coriander seeds, fennel seeds, salt and a few of the peppercorns, toss in one of the cloves of broken garlic and a piece or two of the cut up lemon and one spoonful of vinegar. Put in a small handful of the olives and keep repeating the process until the jar is half full then add the second spoonful of vinegar and continue. Not to forget the thyme or rosemary sprigs if you using fresh and the bay leaves. When the jar is full, finish of by pouring enough olive oil over the contents to completely cover the olives and the jars contents and turn the jar upside down a couple of time to help distribute the spices in the jar. It is important that nothing sticks up over the top of the oil. Place into the fridge and they are ready to use. After one week in the fridge it is a good idea to remove the lemon, garlic, and any fresh herbs that you used to avoid them going bad. The olive and oil will last at least 6 weeks in the fridge. There are a couple of things that you need to keep in mind when you are making these. First is that you must sterilize the jars. The salt and vinegar are there for inhibiting the growth of bacteria so don't leave them out. Bacteria needs air to grow, be sure the entire contents of the jar are covered with oil which helps to inhibit bacterial growth by denying it air. There are several well known Greek brands of olives on the market here. Most of the time it seems they are a bit expensive. I have found a brand in discount markets that cater to Mediterranean customers. They are black with their pits and vacuum packed with a liquid. To be honest they don't look all that great but once opened and crushed they look fine and I prefer these for flavor to the ones bottled from Greece packed in brine. They can be found at Willy's, Hemköp, or ICA Maxi stores at affordable prices. Using fresh sprigs of herbs I think is important if you are giving them as gifts because of the way they look but I don't do that when I make them for myself, I usually just reach into the cabinet for dried herbs.